Popular preschool television programme ‘Boj’, which is regularly watched by over half a million viewers on CBeebies, will soon be offering its legion of fans another opportunity to enjoy the adventures of Boj and his friends in Giggly Park with the release of his first DVD, “Blast Off Buddies” released on Monday 18th May 2015. 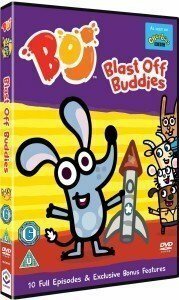 The DVD features 10 episodes of the hugely popular series including the title episode, ‘Blast Off Buddies’ where Boj tries to fix his friend Gavin’s broken toy rocket and fly it to the moon! The DVD offers many exclusive extras, with three sing-along karaoke songs and printable colouring in sheets to really get your little ones involved and fully entertained. And there’s one further unique feature – you can choose whether to watch the episodes in English or in French – C’est Boj-ifique! Blast Off Buddies – Denzil accidentally breaks Gavin’s new toy rocket, so Boj comes up with an idea that will make the spacecraft fly. Flat as a Pancake It’s a hot day in Giggly Park and Denzil has invited some friends over to play. Boj gets a boj-a-boom idea how to mend the leaky paddling pool with Mrs Woof’s extra sticky pancakes! Denzil’s Lost Teddy – Denzil has lost his treasured teddy bear, Snugsy. The Twitchlets have Snugsy and they won’t give him back! How can Boj get him back to Denzil and keep the Twitchlets happy? Keep On Going – Boj, Rupa and Gavin are trekking for their Ranger survival badges. When Gavin’s satnav boots go on the blink, Boj has an idea to get them back on track! Available to pre-order from Amazon for £7.25, and will be available from Sainsbury’s and Asda upon release. To celebrate the release of Boj – Blast off Buddies DVD on Monday 18th May, Boo Roo and Tigger Too are lucky enough to have two copies of the new DVD to giveaway. What type of animal is Boj? Boj is a bilby, had to google it though as I didnt actually know! Boj is a B) Bilby. The answer is B. Bilby. My twin sons love Boj and his buddies! B. Bilby. I wonder if my daughter would like this show. I think she would. Boj is a Bilby. My two girls (3 & 5) love Bilbys! Boj is a – B. Bilby. Great comp thanks! Boj is a – B. Bilby. Boj is B – a bilby.